or just the first template (below). Sometimes when I go to put together a new craft my brain goes into overdrive and I can think of a million different combinations for doing it. This was one of those times. I've tried to give just a few of the alternatives I thought of. big circle stickers or bingo dauber. You can either print just template #1, template #1 & #2 or all three templates. If you aren't sure how many templates you should use, print all 3, but hide #2 and #3. If the kids make it through #1 and are eager for more, bring out the others. If they are tired of crafting, save them for another day. I'm going to walk through this slowly, so bear with me. Look at your paper bag. When the child put's his hand in the bag, he'll be able to make the clown talk. 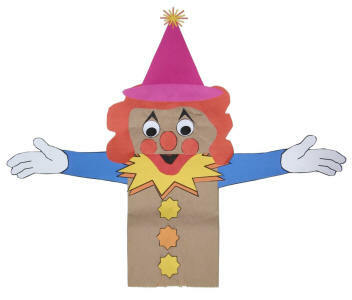 We'll be slipping the clown's arms (template 3) into this flap. Glue the cheeks onto the HEAD. The cheeks should end up looking like a continuation of the mouth. (Don't be too worried about the exact location for really young children. Just let them have fun). Glue the nose onto the HEAD above the mouth. If you like, you can use a large red pom pom for the nose instead of the paper template piece. Glue the hair onto the HEAD above the eyes (try not to cover up the eyes too much). If you like, you can glue pieces of red wool onto the hair template piece to give it a different effect. You can put big circle stickers or bingo dauber splats all over the BODY and BACK of the clown to decorate his costume. Or just decorate with crayons. If you are doing Template #2, decide now! Do Template #2 before you do the mouth or buttons. Glue the mouth underneath the flippy tab, so that most of it shows when the tab is closed (on the template, I drew an arrow to give you an idea of how much should show). Glue the buttons onto the BODY of the clown. You can use the template pieces or three coloured pom poms or three big buttons. If you use real buttons, you may need to put a bit of tape over top to hold them on better. Glue the ruffle onto the BODY, just below the HEAD (where the neck would be). Glue the hat onto the clown's hair. You can glue a real pom pom onto the top of the hat if you like.